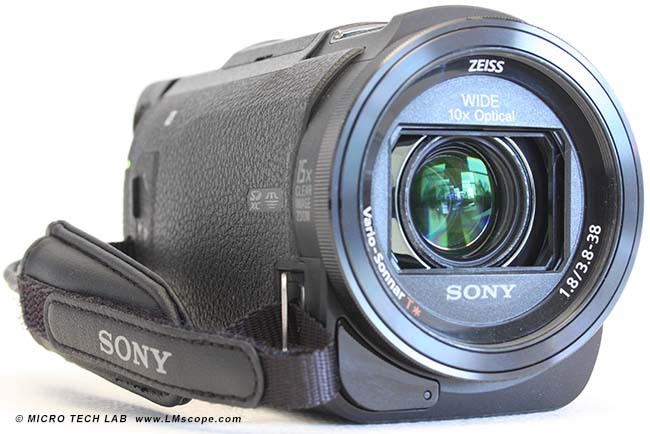 Compact cameras and camcorders are among the most popular types of digital cameras due to their convenient size, ease of operation and the numerous applications they offer. Because of the integrated lens systems being used, they are also particularly well suited for mobile use. 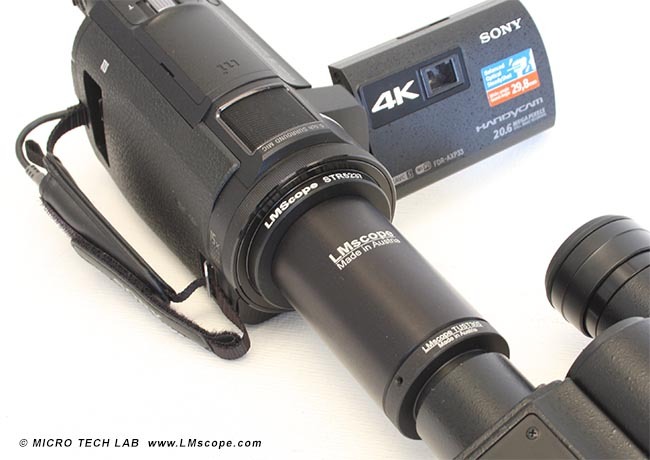 We have developed a special LM compact camera adapter which helps to easily connect compact cameras and camcorders with microscopes. 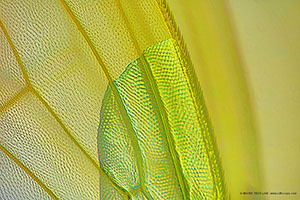 The best and most stable connection to microscopes is possible with camcorders and compact cameras with lenses that are housed entirely within the camera body with filter threads. 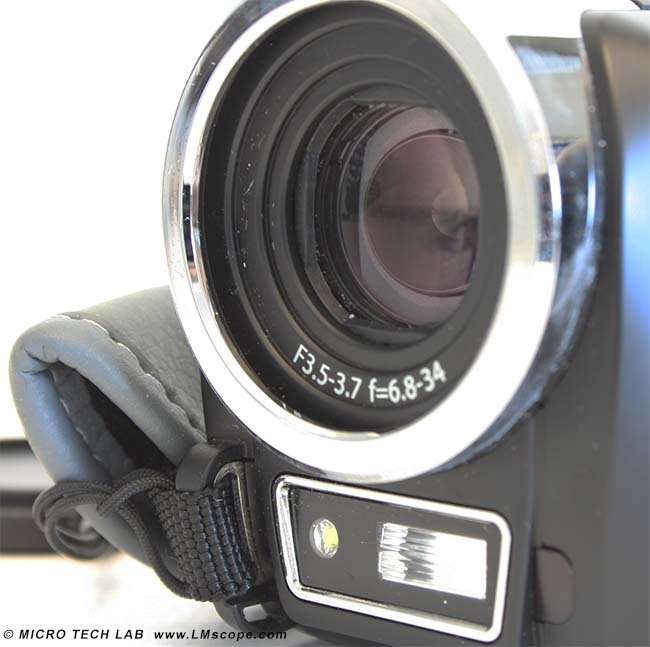 With these cameras the LM compact camera adapter can be mounted directly on to the microscope. Importantly, a firm mechanical connection has the advantage of effectively eliminating any unwanted stray light. Cameras and camcorders that do not have a filter thread can be attached to the LM compact camera adapter using an angle bracket as a connector. The angle bracket features a heavy-duty, machined aluminium panel that has a maximum mounting height of 115 mm. 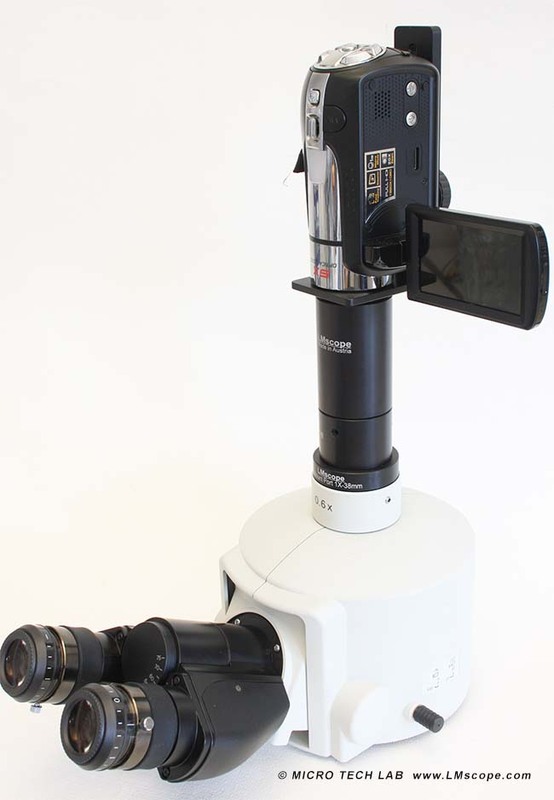 This enables the use of cameras on the microscope even if the lens is in the fully extended position. Our LM wide-field compact camera adapter has a high-quality, plan achromatic optical system, and all of its mechanical components are manufactured from a special aluminium alloy. That exceptional construction makes our products highly durable and long-lasting since they are designed for daily use in professional environments. Of course, the image quality that can be achieved depends to a great extent on the camera being used. Here, preference goes to compact cameras and camcorders with internal, non-extendable lenses equipped with a filter thread. This configuration ensures a firm mechanical connection to the microscope, which prevents stray outside light from entering. 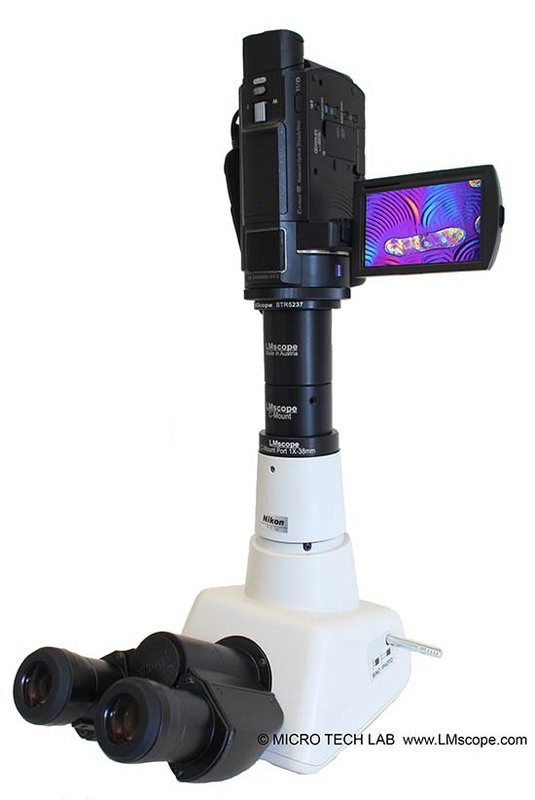 Using our LM wide-field compact camera adapters, camcorders and compact cameras are easily attached to the eyepiece tubes or photo tubes of almost every conventional microscope. 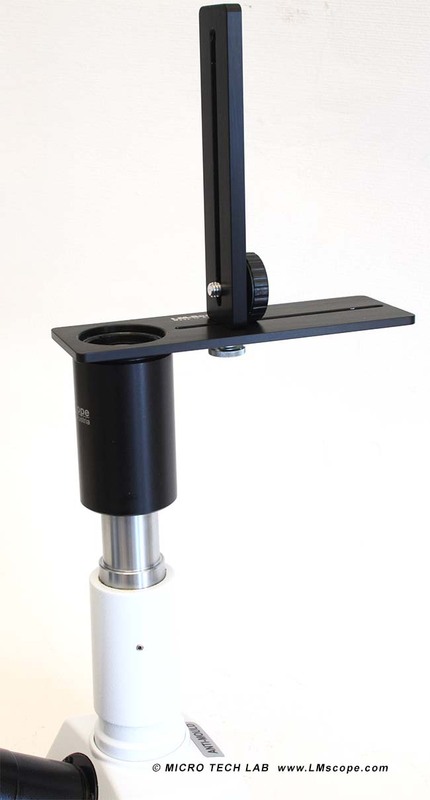 We also offer 1x C-mount ports for many microscopes not equipped with a standard photo tube. In such cases, please email us a photograph of the instrument you are using. 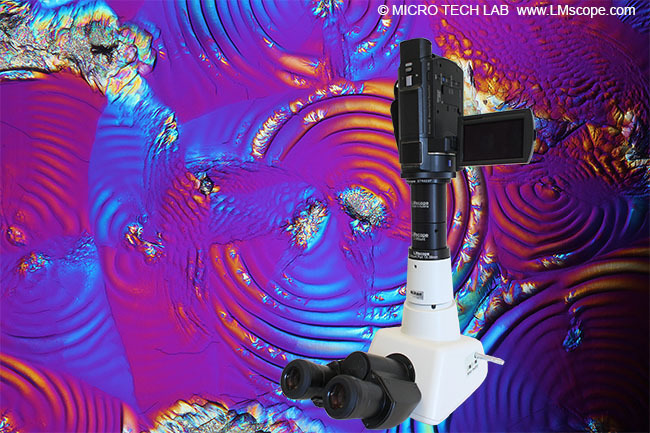 For users who place high value on image quality, however, we continue to recommend cameras that have interchangeable lens mounts (DSLR, system or C-mount cameras), as these still yield significantly better performance in photomicrography applications. Modular design of our adapter solutions: a single microscope adapter fits a wide variety of different connections.